The neon sign above the Ovaltine Cafe on East Hastings is among the best surviving example of mid-Century signage in Vancouver. Opened in 1942, it has resolutely resisted gentrification over the years and been used for numerous screen productions, including The The X-Files and Supernatural. The Hotel American has had quite a history. One of a series of rooming houses along Main St, it gradually declined and closed in 2006, reopening in 2011. This depicts the classic neon sign above Hungry Herbie’s Drive-in diner on HWY 97 in Cache Creek, British Columbia, home of the famous monster burger. Cache Creek is a village a few hours northeast of Vancouver & is a welcome break on any drive up north. This sign is attached to the Sai Woo restaurant in Chinatown. Sai Woo first opened its doors as a chop suey house in 1925. Its original neon sign was likely taken down in 1959 & this new facsimile was installed in 2017. This depicts the well-loved neon sign attached to the Astoria Hastings in Strathcona. The Astoria started life as an apartment building, built in 1912 & converted into a hotel in 1950. Today the hotel is a single-room occupancy rental. I have long loved this heritage neon sign, which peeks out unobtrusively between the trees on Abbott Street in Gastown. It marks the entrance to Winters Hotel, a four-story Edwardian construct, & operating as a hotel since 1907. I came across this great open-air neon Sign Museum on 104th St. in downtown Edmonton last month. The museum includes this famous sign that used to hang above Mike’s News Stand, which operated for 70 years on Jasper Ave. Back in the day, it was apparently the place to go to hear the local gossip, the latest sports scores and the exploits of bush pilots who gathered there. This depicts the sign above the Hi-Lite restaurant in downtown Castlegar, BC. This has been a downtown landmark, and includes a functioning juke box that patrons can play from their table. Such restaurants have been a quintessential small-town Canadian institution for 150 years, reflecting early patterns of Chinese immigration, serving both Chinese & western food at a time when they were perhaps the only restaurant in town. You have to love the Museum of Vancouver! 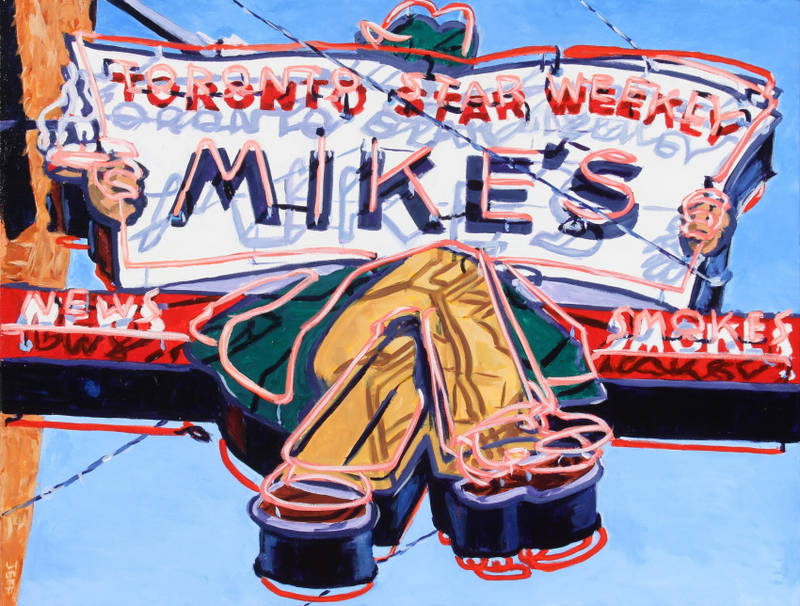 they have this great collection of neon signs in their permanent collection, including this one, which used to grace a famous cabaret on East Hastings & Columbia. This piece depicts the legacy neon sign above the venerable SRO in Vancouver’s DTES. The distinctive apple neon sign above Magee Grocery in Kerrisdale in 1948, four years after the store opened. The crocery has since been removed, and is now a condo development. Foo's Ho Ho Restaurant advertised itself opened in 1954 in Chinatown, served country-style Cantonese cuisine. It closed in October 2014, and the sign went with it. A symbol of DTES renewal, this depicts the new Woodward's sign. It was installed as part of the new Woodward’s revitalisation, which has acted as a great example of mixed-use urban development.